home » News » What’s the working principle of digital FM radio transmitter? What’s the working principle of digital FM radio transmitter? Digital FM Transmitter has essential difference from Analog FM Transmitter. The Digital FM Transmitter includes 6 module parts: Audio Signal Input module; Digital Signal Process module; Digital FM Modulator and Band Pass Filter module; Output power amplifier and low-pass filter module; Man-machine Interface & Communication module and Power Supply & Circuit module. Audio Signal Input module: It receive audio input signal and digital audio (AES/EBU) input signal. Analog audio signal convert into digital audio through (A/D) converter, then input DSP. Digital audio input DSP directly. The DSP will choose which signal can be the input audio signal. Digital Signal Process module: This is the Key part in Exciter/Transmitter, the core is high performance 550MHz digital signal processor (DSP), this DSP can be controlled by software and process digital audio signal for gain adjustment; digital filtering; digital pre-emphasis; digital pilot occurs; digital stereo coding, and then create stereo composite signal flow, after mathematical operation, the flow will be modulated to the FM exciter baseband flow, it will be digital FM flow signal, this flow signal will be sent to 1000MHz Direct Digital Synthesizer (DDS), then change into FM RF Signal. 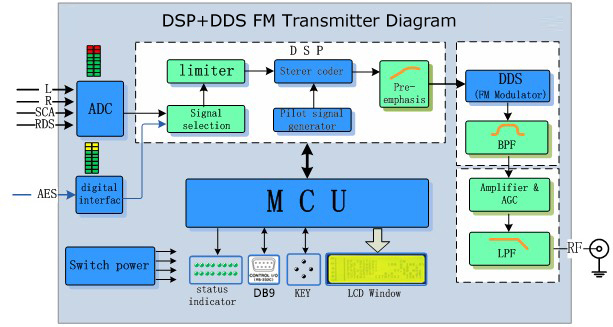 Digital FM Modulator and Band Pass Filter module: The core of this unit is Direct Digital Synthesizer (DDS), it receive digital FM flow signal from DSP, and then synthesize to the digital FM RF signal through its internal direct frequency synthesizer, its internal digital/analog converter can create analog FM modulated signal, finally get pure FM RF signal from Band-pass Filter. Output power amplifier and low-pass filter module: This unit is closed loop Automatic Gain Control (AGC) FM RF power amplifier and low-pass filter circuit. It can ensure the setting output power is stable in long working period. Man-machine Interface & Communication module: This unit uses one high performance System-on-a-Chip (SOC) to process Exciter/Transmitter Man-machine Interface; Operational data collection; Alarm protection; Communication and other functions. All operation order is input by button; LCD screen and light display Transmitter Status. It can use RS232/RS485/CAN/TCPIP communication interface connect with remote PC for data transmission and remote control function. Power Supply & Circuit module: it supply DC stable voltage power for each function units in Transmitter. 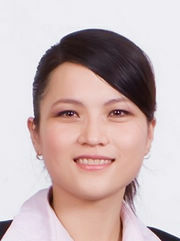 « Previous: What’s the advantage of Digital FM Transmitter?